Peyton should have retired. Period. 96 million dollars can do a lot of things for you, but it can’t change multiple neck surgeries, fused vertebrae, and spinal fluid leaking from you neck. I hope John Elway is proud of himself for winning the dog and pony show for a 36 year old quarterback who should have listened to his body and retired before it all goes horribly wrong. 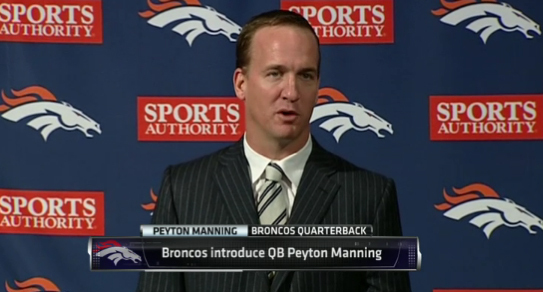 Hopefully, Peyton leads a long and healthy life, despite the ill-conceived decision to step back onto the field. Congratulations to Peyton Manning on signing a 96 million dollar contract. Congratulations to John Elway for landing one of the best quarterbacks of all time. And congratulations to both of you for showing the world once again that pride and greed (which doesn’t always have to be for monetary gain) are capable of clouding the judgment of good men. Here’s the cold, hard truth: 96 million dollars can do a lot of things, but it can’t undo the past. While it cannot be determined exactly when the unreported procedure on Manning’s neck took place, it was at some point after his May 23 surgery in Chicago to correct a bulging disk, and before his Sept. 9 one-level cervical neck fusion surgery in Marina Del Rey, Calif. The same doctor who operated on Manning’s bulging disk in May did a follow-up procedure last summer in Chicago, as a result of the original surgery. Both of those operations came while the NFL and its players were still engaged in their protracted labor fight, with clubs having very limited medical contact with injured players. At the time of Manning’s September neck operation, that surgery was reported to be his third neck procedure in 19 months. In reality, it was his fourth. In addition, league sources say Manning’s neck has potentially developed bone spurs just above the point where his latest fusion surgery took place in early September, and the Colts organization is under the belief that it is nearly inevitable Manning will at some point require further surgery, and possibly another fusion procedure, even if he does successfully return to the field in 2012. It’s unclear how any potential long-term neck issues will impact Manning’s decision to attempt a resumption of his NFL playing career later this year. Peyton Manning is 36 years old. He played over 200 straight games. He had a good career, but he put a lot of mileage on his body. Because he’s a competitor he’ll do anything to get back onto the field, even with four neck surgeries, fused vertebrae, and spinal fluid leaking out of his neck… He’s a grown man and he can do whatever he wants, but I would hate to be the owner who won the dog and pony show for an aging quarterback with a brittle neck, only to have a 350 lbs. linebacker land on his head one frigid Sunday afternoon. I pray to God that Peyton Manning lives a long and healthy life, but at this point in his career I can’t fathom why he would literally put his neck on the line for the game of football. Yes, he’s made football his life…but life is also about more than football. Life is about more than any career, and part of that is family and loved ones. Like a scrambling quarterback with a weak offensive line, I can’t quite shake the feeling that this will all end badly. Previous Entry Shin In Geun’s story: Proof Jimmy Carter is insane? Nice Job Doug…Kinda hit it on the head … er….neck…er….well you get my point. A wise man knows when it’s time to park the bus. He needs to get into coaching, and live happy instead of risking his neck. If he could just spare us the fake southern accent, poor guy. Pingback: Fallujah falls to al Qaeda: Did American soldiers die in vain?